Now imagine a politician raging against the unfairness of American women earning less money than men because women choose careers that pay less and are less dangerous than the jobs men choose. You’ve just visualized the very real propagandizing of President Obama. And we wonder what he thinks of his voters. People who read or watch news know that the 2008 Census showed women earning 77 cents for every dollar men earn because women are choosing careers that more often center around caring for other people. These jobs, such as social work and education, pay less than careers chosen mostly by men, such as petroleum engineer and miner. They know the Equal Pay Act of 1963 prevents companies from unfairly paying women less than men for doing the same job. Women are not being paid less than men for doing the same job at the same employer unless you consider government employees who have automatic pay increases based on their years of showing up at work. In that case, yes, it happens. The U.S. Government, the one that pays Barack Obama’s salary, has also issued reports that women are not being paid less than men for doing the same job, citing peer reviewed studies. 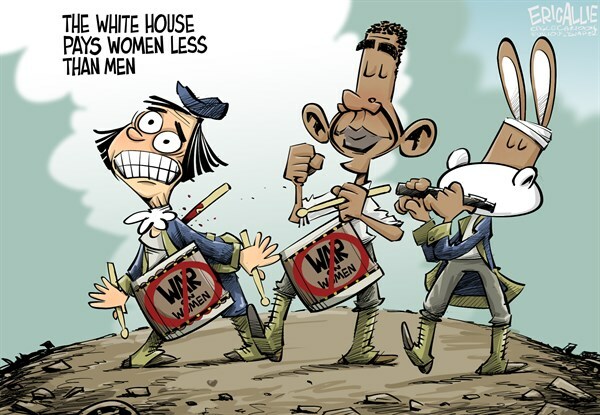 Meanwhile, a widely cited American Enterprise Institute study shows the Obama White House actually does pay female employees 88 cents for every dollar they pay their male employees. When confronted with this undisputed study by a reporter, Obama spokesweasel Jay Carney hemmed and sputtered, saying the women were paid less because they had less experience, less education or had worked in the Obama White House for a shorter period of time than the men. These are some of the same reasons some women… and some men… legally and justifiably earn less than counterparts all around the country. The difference is that President Obama doesn’t mention the real reason for pay disparity in the aggregate. He leans forward and presents lies of omission. The larger issue has nothing to do with the fact Obama is misleading people to frighten them into voting against Republicans. It has everything to do with “why” he uses lies to get votes. This is especially disturbing when he uses lies that are easily discovered and being reported throughout every media platform. President Obama must have a decidedly low opinion of the American people if he believes this false propaganda will win votes. He has to think they are too lazy or too stupid to read. Here is a President who has an opportunity to educate and start a conversation about why it is millions of dollars have been spent on encouraging women to study science and engineering, yet fewer than 20 percent of women college graduates have chosen to earn such degrees. What are the reasons that so many more women are leaving tech jobs after ten years than men? Are they not satisfied in these careers? Are they leaving to start families? With more women in colleges as both undergraduates and in graduate courses, might it be important to find out why they are establishing themselves in careers and then leaving? No, this President prefers to propagandize a non-issue, dividing the country for political profit. © Copyright 2014 Rick Jensen, distributed exclusively by Cagle Cartoons newspaper syndicate.Rick Jensen is Delaware’s award-winning conservative talk show h ost on 1150AM WDEL and 93.7FM HD3, Streaming live on WDEL.com from 1pm — 4pm EST. Contact Rick at rick@wdel.com, or follow him on Twitter @Jensen1150WDEL. April 11, 2014 in Opinion, Politics, President.